53 Boats and Ships From Around the World #Infographic ~ Visualistan '+g+"
For centuries, mankind has transported itself across the globe on boats and ships of all kinds. From navigating narrow streams and rivers on paddle boats, to transporting precious spices and cargo on fluyts, to partying aboard megayachts, to even moving airplanes aboard aircraft carriers, there is no shortage of fascinating seafaring vessels to explore. This graphic explores not only the history of boat and shipbuilding, but also compares the (sometimes vast) size differences between each. For example, did you know that the US Naval Institute says that the main difference between ships and boats is their size? It may sound obvious, but – technically speaking – you can put a boat on a ship, but you wouldn’t want to put a ship on a boat! 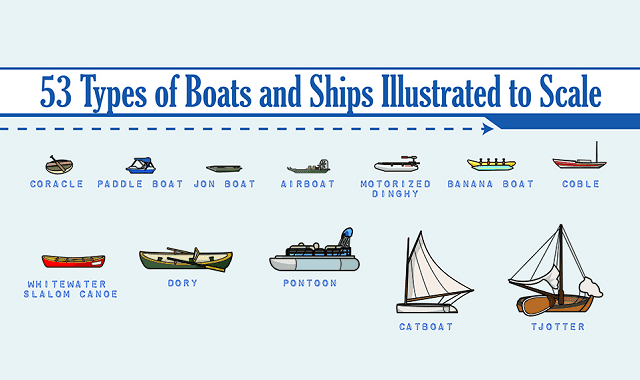 Whether you’re interested in boats, sailing, and shipbuilding, or you just like to explore beautiful man-made creations, you’ll appreciate this graphic featuring 53 boats and ships drawn to scale!